In the reconsolidation process, a target learning is first rendered revisable at the level of its neural encoding, and then revision of its encoding is brought about either through new learning or chemical agents. Through suitably designed new learning, the target learning’s manifestation can be strengthened, weakened, altered in its details, or completely nullified and canceled (erased). Erasure through new learning during the reconsolidation process is the true unlearning of the target learning. When erasure through new learning is carried out in psychotherapy, the client experiences a profound release from the grip of a distressing acquired response. Among the many types of learning and the many types of memory, the type responsible for the great majority of the problems and symptoms that bring people to psychotherapy is implicit emotional learning—especially the implicit learning of vulnerabilities and sufferings that are urgent to avoid, and how to avoid them. These learnings form usually with no awareness of learning anything, and they form in the presence of strong emotion, which greatly enhances their power and durability. For example, if a small child consistently receives frightening anger from a parent in response to the child expressing needs, the child learns not to express or even feel needs or distress and not to expect understanding or comfort from others. This learning can occur with no representation in conscious thoughts or conceptualization, entirely in the implicit learning system. The child configures him- or herself according to this adaptive learning in order to minimize suffering in that family environment. Later in life, however, this same learned pattern has life-shaping, extremely costly personal consequences. The learnings in this example are very well-defined, yet they form and operate with no conscious awareness of the learned pattern or its self-protective, coherent emotional purpose and necessity. From outside of awareness these learnings shape the child’s and later the adult’s behavior, so the individual is completely unaware of living according to these specific learnings. The neural circuits encoding these learnings are mainly in subcortical regions of implicit memory that store implicit, tacit, emotionally urgent, procedural knowledge, not mainly in neocortical regions of explicit memory that store conscious, episodic, autobiographical, declarative knowledge. The ability to identify mental schemata that underpin unwanted behaviours in therapy and bring them into conscious awareness is a vital step toward transformative change. Causing implicit emotional logic (schema) to become explicit and to juxtapose it with a contrasting experience can cause the original learning to become unstable and able to be changed. This is in stark contrast to constructing a new and opposing schema to an existing way of thinking, whereby two schemas are in competition with one another. Transformation takes place when the original learning is completely modified so that the neural connections of the original logic no longer exist, but are replaced with a new logic. Memory reconsolidation (MR)—a foundational process with the potential, if properly understood, to consistently bring about the kind of transformational change that we look for in the lives of clients—is the subject of this book. Featured in this issue is Bruce Ecker, one of the foremost experts in applying techniques that fulfil the neurobiological requirements to achieve MR in clinical practice. In fact all of the authors in this issue are experts in their respective fields, demonstrating the unifying nature of MR in such diverse therapies as the Alexander technique, energy psychology, neuro-linguistic programming, and progressive counting. Understanding the biological basis of our memory and how it can be modified is the key to effective therapeutic change, especially when emotional memories are driving unwanted symptoms. 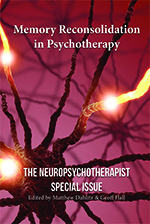 The content of this special issue has been previously published in The Neuropsychotherapist or the International Journal of Neuropsychotherapy.